Q. What is the physiology behind CPR in cardiac arrest? Q. How well is manual CPR done in the field? Q. Why do we need to consider the diagnosis beyond “cardiac arrest”? Q. What is the physiology behind CPR? The Cardiac Pump Model – describes direct compression of the heart between the sternum and the vertebral body leading to blood being squeezed out of the heart with compression and fresh blood entering the heart during recoil. This no doubt occurs but is likely to be less important overall than the Thoracic Pump Model. Thoracic Pump Model – where thoracic pressure changes themselves are responsible for blood flow being generated during CCC. In the immediate few minutes post cardiac arrest the heart is still well supplied with oxygen and metabolites but an electrical dysrhythmia (such as Ventricular Fibrillation or pulseless Ventricular Tachycardia) has stopped cardiac mechanical activity. During this phase defibrillation is the priority. 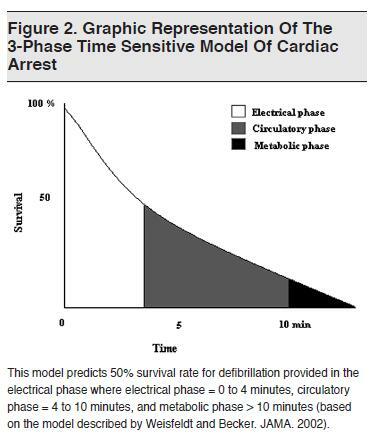 Early defibrillation is an ILCOR class I recommendation in the electrical phase but is only rarely seen prehospital, such as when the patient arrests whilst being monitored (eg when en-route to hospital for chest pain), or in the immediate vicinity of an AED and skilled bystander. In the Circulatory Phase from 4 to 10 minutes after cardiac arrest, the priority is to initiate CPR to provide oxygen delivery to the heart and other organs, followed by defibrillation, which may be delayed by 1-3 minutes. CPR before defibrillation increases the chances of effective electrical therapy. The concept is that defibrillation of a globally ischemic heart is unlikely to be effective and the results are better with improved coronary perfusion with CPR. The Metabolic Phase is beyond ten minutes from cardiac arrest. The effectiveness of both defibrillation and CPR followed by defibrillation are now declining. The chances of restarting the heart prehospital are becoming low but animal models suggest that mechanical CPR may be able to provide sufficient coronary and cerebral perfusion to maintain integrity of the patient until other definitive interventions can be insituted in hospital. These may include percutaneous coronary intervention (PCI) with mechanical CPR or extracorporeal membrane oxygenation (ECMO). ‘Q-CPR’, or Quality CPR (covered on the next page) may prolong the period of the circulatory phase and improve the potential for defibrillation. Despite the best intentions of rescuers the literature suggests that achieving high quality CPR is often challenging both in prehospital and in-hospital environments. There is no question there remains an unacceptable variability in quality of closed chest compressions both between and within systems. Abella, B. et al. Chest Compression Rates During Cardiopulmonary Resuscitation Are Suboptimal. A Prospective Study During In-Hospital Cardiac Arrest. Aufderheidea, T. et al Incomplete chest wall decompression: a clinical evaluation of CPR performance by EMS personnel and assessment of alternative manual chest compression–decompression techniques. Wik, L. et al Quality of Cardiopulmonary Resuscitation During Out-of-Hospital Cardiac Arrest. Click on the following link to view a clip from the Channel 10 series on ASNSW “Recruits” which demonstrates the challenges and risks to staff of performing CPR en route to hospital. Comment: I think the “new recruit” did a great job but high quality, interruption free manual CPR is impossible in transit. “Cardiac Arrest” is NOT a diagnosis. It is the final pathway for all pathologies leading to death and it is essential to consider the underlying pathological process. 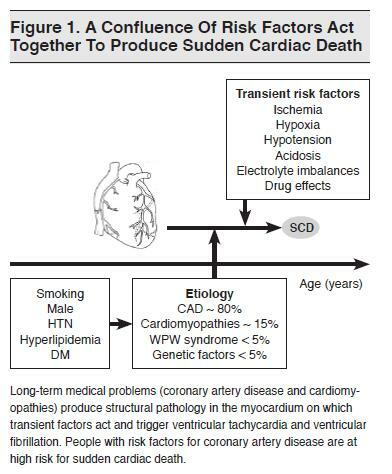 In out-of-hospital cardiac arrest (OHCA) or more specifically “sudden cardiac death” after the first few minutes we are interested in reversible pathologies which may influence our management beyond simply following ACLS algorithms. 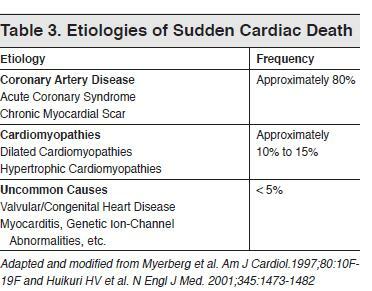 The most common cause of “sudden cardiac death” is coronary atherosclerosis leading to ischaemia or infarction. Some of these causes are amenable to therapy and the diagnosis will significantly change our management. Be prepared to keep an open mind on the underlying diagnosis as new data is collected – ECG / clinical examination/further history etc. The importance of “making a diagnosis” increases with younger patients. A provisional diagnosis must be written on the clinical records for all patients attended.